The Bogdan Corporation has issued its first electric truck ERCV27 for loading solid household waste under a contract with Denmark's Banke Electromotiv. The truck was presented on November 22 at the Bogdan Motors automobile plant in Lutsk with the participation of Ukrainian Infrastructure Minister Volodymyr Omelyan. "We are gradually refuting the widespread opinion that Ukraine is exclusively agrarian. The presented electric transport is fully designed and created in Ukraine. It will be "Made in Ukraine" in the European Union," the ministry's press service reported on its website, citing Omelyan as saying. The press service of the Bogdan Corporation said that the mass production of cars will begin after their certification in Denmark. As reported, the agreement signed between the Bogdan Motors plant in Lutsk and Banke Electromotiv for the designing and production of garbage collection trucks signed in the spring of this year involves the manufacture of 15 trucks. In general, Banke Electromotive requires about 200 trucks a year. "As long as European companies order ecofriendly special vehicles for the removal of household waste from a Ukrainian manufacturer, our state is lagging behind in this matter. 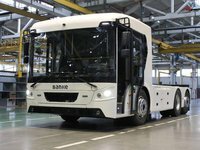 Although the Bogdan's electric truck with its characteristics is ahead, and the company is ready to produce it for Ukrainian cities," the corporation's press service said. In turn, according to the press service of the Infrastructure Ministry, Omelyan pointed out the importance of creating conditions for the development of electric transport in Ukraine as soon as possible. "We have visited a workshop that is ready for operation, we just need to start it. To do this, we need to create conditions for restoring the automotive industry in Ukraine. In particular, we initiated an electric bus at the Boryspil airport, and I hope it will be Ukrainian electric bus," the press service said, quoting Omelyan.